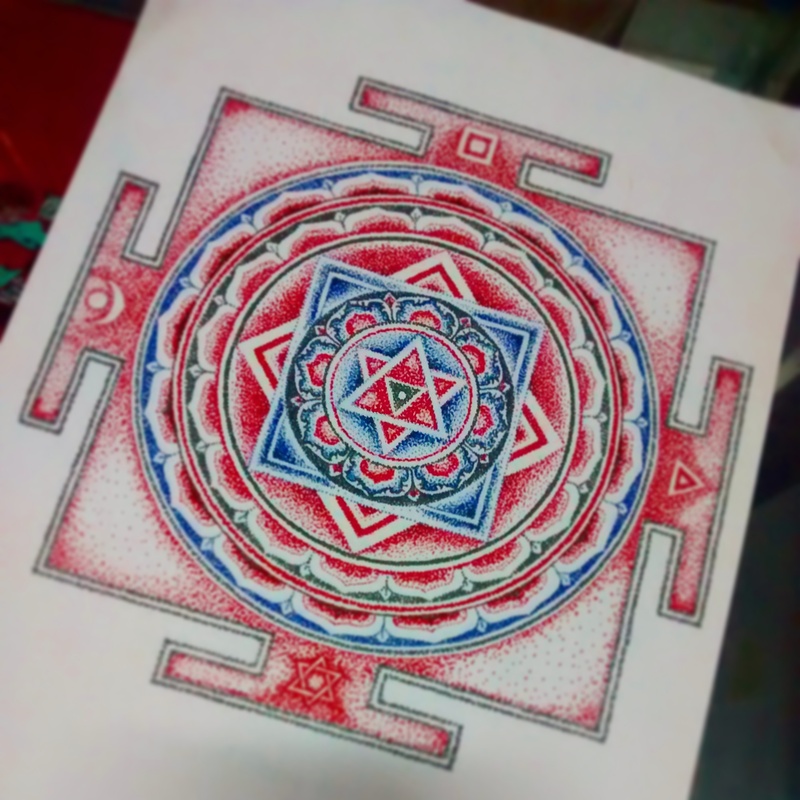 One more addition to The Tattoo Temple – Sacred Hindu Yantras Collection. The Shiva Shakti Yantra is one of the most Sacred & Popular Yantras. Following is a brief description of the Various Elements & their meanings. ‘Shatkona’ or Six-pointed Star The Shatkona is a symbol for Shiva and Shakti. It is made from two trikonas, Shiva is represented by the upward pointing triangle (△) and Shakti by the downward pointing triangle (▽). Shiva represents the masculine side of God and the parashiva, the all pervasive mysterious form of Shiva without qualities. Shakti represents the feminine side of God and the parashakti, the power of Shiva. The upward-pointing triangle can also represent purusha (the supreme being), and the downward-pointing one Prakṛti, or the world seen as mother nature. Overlapping they remind us that all these are qualities of one God, neither male nor female but encompassing both (✡). This symbol appears in the twelve-petalled Anahata chakra, or heart chakra. The hexagram is called the Shatkona, and is equivalent to the symbolism in ritual magic. The Shatkona is the combination of the Shiva kona (trikona, triangle), the symbol of the God Shiva, representing the element of fire, and the Shakti kona, representing the element of water. Together, they represent the union of male and female, and the heart chakra. The Shatkona is a hexagram and is associated with the son of Siva-Sakthi, Lord Muruga. The heart chakra, Anahata, is related to love, equilibrium, and well-being. Anahata (Sanskrit: अनाहत, Anāhata) is the fourth primary chakra according to the Hindu Yogic and Tantric (Shakta) traditions. In Sanskrit the word anahata – means unhurt, un-struck and unbeaten. Anahata Nad refers to the Vedic concept of unstruck sound, the sound of the celestial realm. The Anahata chakra is positioned in the central channel behind the spine at the heart region, with its kshetram or superficial activation site actually in the heart region between the two breasts Anahata is represented by a smoke grey lotus flower, with 12 vermillion petals. Inside of it is a smoke-coloured region that is made from the intersection of 2 triangles, creating a shatkona. The Shatkona is a symbol used in Hindu yantra that represents the union of both the male and feminine form. More specifically it is supposed to represent Purusha (the supreme being), and Prakriti (mother nature, or causal matter). Often this is represented as Shiva – Shakti. Anahata is considered the seat of the Jivatman, and Para Shakti. In the Upanishads, this is described as being like a tiny flame that resided inside the heart. Anahata is so called because it is in this place that sages hear that sound (Anahata – Shabda) which comes without the striking of any two things together.”. It is associated with the element of air, the sense of touch, and with actions of the hands. Anahata is associated with the ability to make decisions outside of the realm of karma. In Manipura and below, man is bound by the laws of karma, and the fate he has in store for him. In Anahata, one is making decisions, ‘following your heart’, based upon one’s higher self, and not from the unfulfilled emotions and desires of lower nature. Meditation on this chakra is said to bring about the following siddhis, or occult powers; he becomes a lord of speech; he is dearer than the dearest to women; his senses are completely under control; and he can enter at will into another’s body. Anahata is said to be located near the region of the heart. Because of its association with touch, it is associated with the skin, and because of its association with actions of the hands, it is associated with the hands. In the endocrine system, Anahata is supposedly associated with the thymus gland, located in the chest. In kundalini yoga, anahata is awoken and balanced through practices including asanas, pranayamas, and the practice of ajapa japa (repetition of a sacred mantra). It is purified through the process of bhakti (devotion).